The Texas Rangers' 23-year-old slugger is baseball's king of the Three True Outcomes, and he's finally found a home in the major leagues. First it was Aaron Judge. Then it was Cody Bellinger. Even Scooter Gennett got a day. Now it’s Giancarlo Stanton. Yet in a year where home run hitters are the biggest stars in baseball, Joey Gallo has yet to get his turn in the spotlight. It certainly isn't due to a lack of longballs. Gallo, the Rangers' 23-year-old slugger, has hit 35 homers, second only to Judge's 37 in the AL. In fact, like Judge and Stanton, Gallo has a propensity for the extra-long ball, but unlike those two, he also has a propensity for doing little else at the plate. While Judge has a .291 batting average and Stanton's is at .287, Gallo is batting just .211. His immense power, coupled with his inability to make consistent contact, has made Gallo one of the most compelling cases in today’s game. He’s simultaneously the first and last guy that pitchers want to see in the box—a 6’5” free-swinging mountain who can either miss a pitch by a foot or deposit it into the second deck. He has the most 450-foot homers in the majors, the third-most roundtrippers in the AL with an exit velocity of 110 mph or more and he leads the league with a 37.1% strikeout rate. One cut will have you believing he’s one of the game’s most dangerous hitters, and the next will convince you he could use some more time in Triple A. He is quite possibly the most extreme example of the ‘Three True Outcome’ hitters that have become increasingly common in baseball. Those categories—home runs, walks and strikeouts—are the only ones in which the outcome is not dependent on the defense. Through Wednesday Gallo had tallied 52 walks and 146 strikeouts in addition to his 35 homers, meaning that 59.1% of his 394 plate appearances have ended in one or the others (Stanton, by contrast, is at 43.8% and Judge is at 56.6%). All those walks have helped Gallo keep his on-base percentage at a respectable .324, but he has just 20 singles, putting him on pace to join Barry Bonds and Mark McGwire as the only hitters to qualify for the batting title in a year in which they hit more home runs than singles. Gallo's hitting profile is nothing new, though, and neither are the concerns that have been raised by it. In 162 minor league games over five seasons, Gallo, a first-round pick by the Rangers in 2010 out of Bishop Gorman High in Las Vegas, struck out 222 times. In his first two seasons, 2012 and '13, he struck out in 34% of his plate appearances and as he advanced through the minors that number actually rose, peaking at an astronomical 39.5% in his first taste of Triple A in 2015. He made his major league debut that year and his strikeout rate was even worse, 46.3%, though he did hit six home runs in his 123 PAs. In just 30 plate appearances in 2016 he whiffed out 19 times (63.3%) while adding one home run and five walks. Gallo was given the chance to be the everyday third baseman this spring when Adrian Beltre opened the year on the disabled list. He seized his chance, earning the Rangers' player of the month award for April with seven homers and 16 RBIs, though he hit just .213. “That was huge for me, because it showed that I can help this team win even when I’m not at my best,” he says. 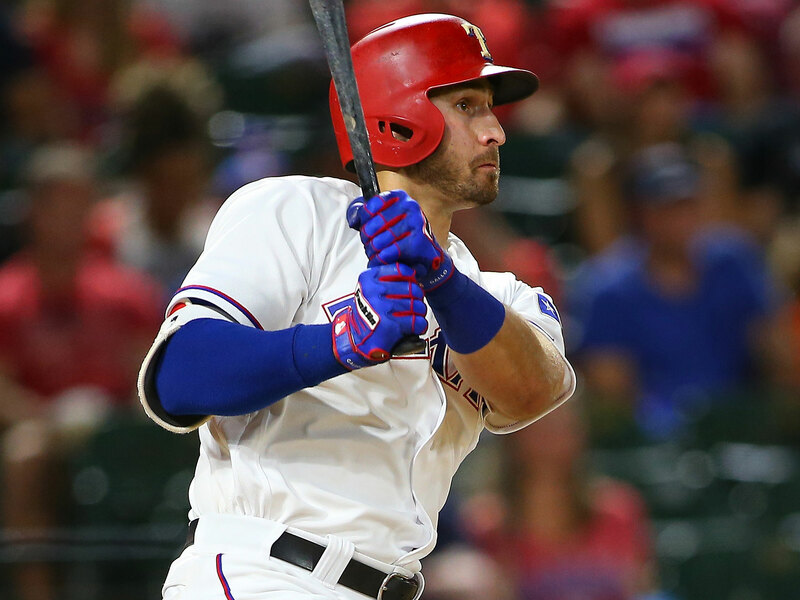 Gallo recognizes his role is to turn his at-bats into runs quickly, especially for a team that scores nearly 50% of its runs via the homer, the second-highest percentage in baseball. Following a 4-0 shutout loss to the Marlins on July 24, Gallo—who had the night off—pulled aside hitting coach Anthony Iapocce. He wanted to know, of the Rangers’ eight hits, how many went for extra bases? The next night, Gallo drew the start in leftfield—he spends most of his time at third base (56 starts) and first base (32 starts)—and hit two of the team’s four home runs en route to a 10–4 victory over Miami. He doesn’t have to focus on anything but hitting homers, and yet, he envisions himself being a more complete hitter by this time next season. “I believe I can be a .270 guy,” Gallo says. Gallo, in just his first season, has already made encouraging progress. Batting just .194 at the All-Star break, he’s hit .261 with 14 homers since, thanks in large part to an increased effort to hit the ball to all fields and do damage early in the count. Through Tuesday, his average on the first two pitches has risen from .333 to .444 since the break, and he’s increased the amount of balls he hits back up the middle by over 12%. Along the way, he’s seen a 4% difference in his swinging strike rate and a 6% climb in his contact rate. The improvement isn’t drastic—a 62% contact rate since the break is still around 15% lower than the league average—but it is a sign that he can make more contact while staying true to he is. Gallo will probably never be a .300 hitter—he may never even sniff .280—but he can still be comfortably north of the Mendoza Line. He always will, but this year Gallo has proven that he can be an everyday player in the major leagues. If the past month is any indication, Gallo’s greatest feat is yet to come.